Go to Piecemakers Online Store to order! 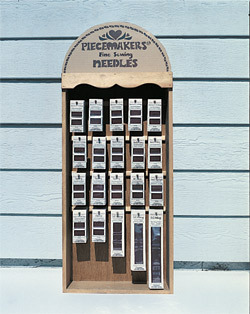 Why are quilters and sewers worldwide asking for Piecemakers needles? Let us share how they came about and why we think they are the best. Like most shop owners around the country, we listen to our customers. Complaint after complaint came in about the poor quality needles available. "Can't you find a better brand? ", they'd say. We switched from brand to brand. Some were better than others, but none completely satifactory. Eyes would break, points were dull, needles were hard to thread -- the list went on. Our friend showed us the tests run by the manufacturer for needle strength, as well as magnified pictures of eyes made to check for rough edges. We did comparison tests in our store, and our students used them and examined them for size. All reports were "thumbs up". This was too good to be true! Clean Eyes - They won't fray the thread. Sharp - They go through fabric like a hot knife slides through butter. Sturdy and Strong - It takes a lot to break them. Easy-to-Thread - We don't claim everyone can thread the smallest needle, but they sure are the easiest we have found to thread. Now we've been selling them to individuals and stores since 1986. We're still small, so we haven't gone "big-time" in advertising, but the good news is spreading by word of mouth. Beading - for stringing jewelry beads, stringing and sewing beads on fabric. 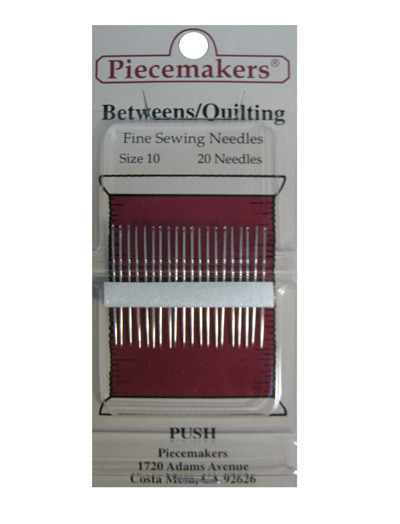 Quilting Betweens (sizes 8, 9, 10 & 12) - For quilting, hand piecing and applique. Betweens are available two ways: packaged in their own individual sizes and in two assorted packages - 8/12 assorted (made only by Piecemakers) and 5/10 assorted. Dollmaking (sizes 3 1/2" or 5 1/8" or 7") - For embroidering features, putting on hair, buttons for eyes, hand stitching body parts, and basting quilts. The larger sizes are for jointing and joining doll or teddy bear body parts, tying quilts and upholstery. Dollmakers are available in three packages - 3 1/2" or 5 1/8" or 7". Doll Sculpting (Darner No. 7) - For sculpting dolls in woven or knit fabrics, basting, mending (recommended by elinor peace bailey). Hand Applique - For hand applique, piecing and sewing on delicate fabrics -- thinner and longer than a quilting needle. Sharps (assorted sizes 5/10) - For general hand sewing and hemming. Milliners (sizes 3/9 assorted) - These needles have endless uses -- basting quilts and other extensive basting jobs, putting eyes on small dolls, beading (the shorted needle works), some embroidery. Embroidery (sizes 5/10 assorted) - For all types of embroidery and crewel on finer fabrics. Embroidery (size 7) - Especially sized for picture smocking and "chicken scratch". Embroidery (size 8) - For geometric English smocking. Tapestry (sizes 22, 24, 26 and 28) - A blunt point needle for cross-stitch, needlepoint, silk ribbon embroidery and embroidery on open-meshed materials. Chenille (sizes 18/22 assorted, sizes 20 and 22) - Similar in length to tapestry needles but with sharp points and a larger eye, this needle is used for silk ribbon embroidery, tying quilts, crewel work, candlewicking, embroidering with #3 or #5 Perle cotton and stitching on coarse materials. Calico Braided Rug - For lacing and stitching cotton fabric braids together in rug making and for ribbon embroidery with wide ribbons. Works well on leather, too.